Modern central banking self-imposed a targeted inflation level of two percent. Economic studies showed that moderate inflation encourages spending, the very thing that sits at the heart of economic progress. As such, central banks from the Federal Reserve of the United States (FED) to the European Central Bank (ECB), and from the Swiss National Bank (SNB) to the Bank of England (BOE), target inflation below or close to two percent. Effectively, it means that if inflation remains in a corridor between, say, 1.8% and 2.2%, the central banks reach their mandate. In Forex trading, retail traders and not only, focus on the inflation level to anticipate the next move in the central bank's policies. The rule of thumb says that if inflation is on the rise, the central bank will increase the interest rate. Or, when inflation falls, it’ll cut the level of interest rate. To further understand the process, here’s a definition of the two essential elements that make this beautiful economic riddle: inflation and interest rates. Inflation refers to the changes in the price of goods and services in an economy. In economic terms, the release is called the CPI or Consumer Price Index. Central banks pay interest for the excess liquidity commercial banks park in overnight deposits. Therefore, when the inflation rises and the price of goods and services spiral, the central bank raises the interest rate. The idea is to stimulate commercial banks to reduce lending to businesses and public, and to park the money at the central bank, for a higher interest rate level. A precise definition of interest rates means that they represent the cost of borrowing money. While the central bank doesn’t borrow from commercial banks, it does pay interest to reward the trust. Deflation happens when inflation becomes negative. That’s, at least, the economic definition of it. In plain English, traders should know that when the price of a product falls, instead of rising, that’s the first sign deflation occurs. The problem with deflation is that central banks find it difficult to combat. After all, central banks do have limited resources, and a relative tighten corridor to fight low inflation. Any logical thinking starts from the targeted inflation, the two percent level. From two percent to zero, there’s not much a room to maneuver, and when things precipitate, inflation falls sharply, leaving central banks behind the curve. The best example comes from the oil market. Oil is a significant driver of inflation, and central banks around the world closely monitor the price of it. Towards the end of 2014, a triangle as a reversal pattern broke lower, sending the price of oil in a downward spiral. 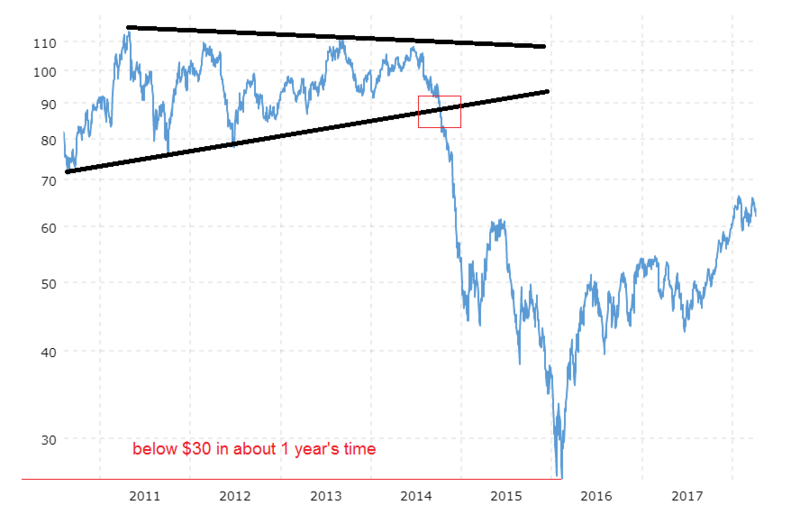 To put it into perspective, oil dropped from around $100/barrel to below $30/barrel in a little over one year. That’s too quick and fast for any central bank to react appropriately. When oil falls, inflation falls also, and the threat of deflationary spirals becomes a reality. But the main problem wasn’t the falling price of oil, but how fast it dropped. The prices will stagnate, and inflation will quickly hit the bottom of the range (zero level). A central bank uses the interest rate to react to inflation levels and economic downturns/upturns, or cycles. But what do you do when the interest rate level is at zero and inflation still not rising? Oil being a commodity, it reacts quickly to changes in supply and demand. Discoveries also influence its price. But above all, oil is a geopolitical weapon. If there is one product that changed the shape of the world we know it today, that’s oil or petroleum. Either for geopolitical reasons or simply as a balancing act between supply and demand, the sharp fall send shivers down the central banks’ spines. The logical assumption will be that inflation will drop soon enough. And indeed, it dropped. In some cases, well below the zero level. Capitalisms teaches us that when inflation drops below zero, deflation appears. But deflation as an economic term has such a negative quotation, that central banks just refused to use the term. Hence, negative inflation appeared, but it’s just a different way of saying deflation. The problem is that consumers will stop spending if the prices keep falling. Hence, the economy will succumb as the engine, the consumer spending, stops working. In such instances, the central banks have the ingrate job to stimulate the economy. Or, inflation, to see the prices rising. For that, they embarked on unprecedented monetary policies, some of them unthinkable only a few years ago. When Japan ventured and sent the interest rate in negative territory, the entire world watched stunned by the move. Yet, nothing happened. As such, other central banks in various jurisdictions around the world did the same. Switzerland, the Eurozone, and some European Nordic countries, still have the interest rate below zero. Did the economy improve? Yes. The Eurozone, for example, enjoys a remarkable economic recovery, despite the numerous challenges it faced (e.g., Brexit). The unemployment rate fell at levels not seen since the start of the 2008 financial crisis, GDP grows at a robust pace, etc., and all due to the stimulus packages the ECB applied. Among them, or at the core, sits the negative interest rate that is in place to this day. 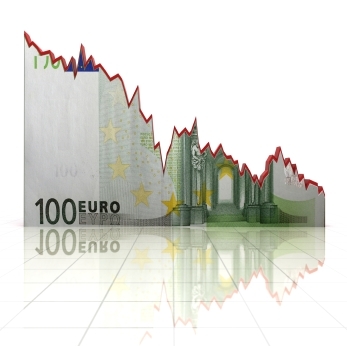 Did ECB manage to fight deflation? With inflation slowly but surely perking up, reaching a little over one percent now, the danger seems to be behind. However, considering the time and effort to achieve even one percent inflation (which is still well behind the ECB target), fighting deflation is an expensive thing to do. Entire generations may end up suffering from the worst thing that can happen to a capitalistic economy. If in doubt, check Japan’s deflationary trap in the last couple of decades.